Any code in the whistler signal? In part III-1 we reported about the actual state of knowledge concerning the exploration of ELF-signals received within housing areas - and we described the detailed structures of the hearbeat signal. In this part, we will tell the readers a little more about the structures of additional signals and show the big variety of the signals received until now. The whistler signal is one of the most interesting signals we recorded as it seems to carry some kind of information (see Part II). The signal was recorded daily at irregular times at Hürtgenwald from 2004 to 2006 and, to our surprise, a few days during a holiday each morning in fall 2009 at the small village Wöhrden in northern Germany near the coast of the north sea. The intensity there was very high. Only five meters away from the house where the receiver was installed, one of these grey metal cases was positioned at the border of the sidewalk. This was confirming my suspicion, that the emission of the signals must have something to do with these cases. By the way, similar signals but less strong appear very rarely at Mariadorf (home of Kurt). Played back with a higher speed (160 times) the signal sounds like a whistled melody with a low noise in the background (which is typical for a human whistling). The whistling does not sound like a melody as the different tones have no harmonic relation. Each tone has a length of 0.2 seconds (accelerated playback), followed by a pause which is a little bit shorter. 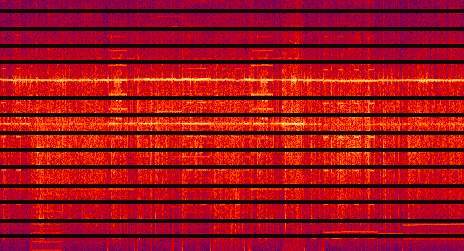 If you zoom the spectrum vs time signal (figure below), you find out that the single whistle sections are modulated in their frequency. These modulation patterns can be classified to different structures, for example mounting frequency, falling frequency, constant frequency and combinations of these patterns (see below). What's also interesting is the fact, that the frequency of the next whistle starts exactly where the frequency of the previous whistle ends. Depending on the fact, if the last whistle had a falling or a mounting frequency shift, the complete sequence of whistlings has the shape of a continuous curve with falling and rising sections and without any frequency jumps. In the zoomed screenshot below, you clearly recognize the typical frequency modulation patterns of the whistling and also the pauses between the whistlings. The figure below shows the time structure of the signals over a longer period of time. The transmission begins with a longer sequence of signals, consisting of about 60 whistles. Then, after a break which corresponds to approximately 12 whistles, three sequences each consisting of 12 whistles are following. These shorter sequences are separated by pauses corresponding to 6 whistles. 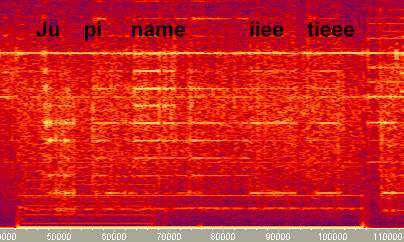 Most of the received whistler signals are characterized by this pattern. When looking at the spectrum versus time diagram below (it's even better if you listen), you see a whistle signal with much lower intensity during the pause times, which looks (and sounds) like the answer of another, more distant station. Figure: Two examples for answers of a distant station during the pauses. Another interesting part of the whistler signal is its beginning. The figure below shows the beginning of a transmission. On the left in the diagram, you can see that the transmission starts with a sequence of tones which are much shorter than the whistling itself and which have no background noise. The sound is very characteristic with a kind of stumbling beat, if you compare it to musical notes. Each whistler transmission is characterized by such an introduction and until now, we could not find any matching between two of those sequences. If the whistling signal is really a kind of data transfer, then may be the introduction sequence is like a key for a certain code the signal is based on. To find an answer to this question, I splitted the single whistles of all appropriate signals received in 2004 into different groups by using screenshots from the Cool Edit FFT vs time function and grouped them togehter again by their shape. By doing this, I could clearly separate 11 different signs, which were spread very regulary among the signal. Beside this signs, there was a few number of signs which could not be interpreted clearly. The first two typical signs are inverted sinewave and sinewave, shown in the figure below. Remember: The figure shows a number of equal signs collected from different recordings or different time positions within one recording, but never emitted in the range you can see in the figure. The right part of the figure shows slashes going from the lower left to the upper right corner. The left part of the figure below shows inversions of the slash in the figure above. At the right part, the next character , a V-shaped line, can be recognized. For the V there also exists a clearly visible mirrored version, shown in the left part of the figure below. At the right part of the figure, a horizontal character is shown which means, that the frequency stays constant during the whistle. The following characters are not quite clear. It cannot be excluded that they belong to one of the categories described above and are a little distorted by bad propagation conditions. It could also be that these characters are combinations of horizontal lines and positive or negative slashes. Figure:Are these characters four combinations of horizontal lines and slashes? The different Y-axis-offsets of the characters are caused by the fact that they are picked randomly from different positions of a continuously mounting and falling time signal. The different characters can not be recognized by only listening to the accelerated playback signal, because the characters are to short. But as the data transfer of each character lasts more than 20 to 30 seconds in real time, automatic decoding by some kind of electronic circuit should be possible (if it is data transfer at all). As, in some natural civilizations on earth, whistling languages to communicate over big distances have been discovered, the idea that these ELF whistling signs are a kind of communication is not beside the point at all. The fact, that a new signal starts at the same frequency where the last signal ended is a little strange and may tell us something about the origin of the signals. If the characters were generated by PC or by an electronic circuit, they all would probably start at the same frequency. As this is not the fact, I could imagine that the characters are created mechanically by some kind of rotating electric generator and that the frequency modulations are caused by flanging the rotating mass, that means by accelerating it or slowing it down. A method like this would exactly generate the course of the signals in question. Of coarse this is only an assumption which sounds a little implausible, especially as such a kind of signal generation is unknown, but the signals in question are unknown as well. In September 2009, a strong whistler signal which appeared each morning between 7 and 8 AM was discoverd near Büsum in northern Germany (during a holiday). At the beginning of this article, we asked why some signals do suddenly appear, are present for some days, weeks or months and then disappear again for ever? This is not typical for machines used by housewives or hobby craftsmen. A typical example for this fact is the needle printer signal. This signal appeared for the first time in December 2004 at Hürtgenwald with very high intensity and could be received uninterruptedly for a few days, disturbing all the other signals described in our parts I and II. The figure below shows four elements of a repeating structure of 160 seconds (realtime). These structures sound exactly like an old fashioned needle printer, printing out one line. The figure below shows the corresponding time signal. The resolution is not high enough to visualize the complicated structure of one element. Figure: and shorter until their time distance is about 1,6 seconds. Then, the pulses are getting longer and shorter again alternatively (not shown in the figures). The structure of the signal shows that it might be of an artificial origin, but if its really data transfer can not be said clearly. Inspite the fact that all elements sound equally, data transfer cannot be excluded: If you listen to a needle printer, it also seems that each printing of a line sounds equal though each time different characters are printed. Radio teletyping, a method to remote a printer via radio frequencies (e.g. shortwaves) over longs distances, was a very important tool to spread news before the age of satellite- and internet communication and was not only used by news agencies but also by military, police and secret agencies. The principle is rather simple: A radio frequency carrier of some MHz is shifted in its frequency between at least two constant values with a certain speed of at least a few times per second. The difference between the two frequency limits was about a few kHz. With a beatfrequency oscillator, used in shortwave receivers, the shifting can be transformed in an audible range, resulting in a sinewave tone changing quickly between two notes. In addition, more complicated RTTY transmitters used multichannel methodes to increase the data transfer and sounded like a permanent chinese gong when made audible in a receiver. With a little luck and a good shortwave receiver, it is even possible to find this kind of data transfer today. The jumps between the frequencies have a similar structure like bits and bytes in a computer and indeed can be interpreted as characters by simple electronical devices. What's quite normal in the range of commercial radio frequencies seems to be very strange in the ELF range: Below 16 Hz, we received signals which correspond exactly to the RTTY data transfer described above: Carriers who permanently jump between two or three frequencies of only a few Hz. In contrary to normal RTTY, one bit of the signals we received lasts many seconds or even minutes. Sending out only one word therefore would last a minute or more. If its really data transfer: Who would accept such low transfer rates and such a long transfer time if there would not be any advantage which pays for the patience? On the other hand, facing the spectrum analysis of such signals, it's hard to find something different than data transfer as an explanation. The following signals not only show the simple type which consists of jumps between two fix frequencies but also the more complex multichannel signal type. The first picture shows the analysis of a signal recorded at Hürtgenwald. Besides the signals in question, also the cow- and the goose signals are visible in the background. The signal is characterized by a lot of parallel spectral lines, changing their structure in time. The parts of the signal characterized by fast modulation appear a little bit blurred due to technical reasons, but if you are listining to it, you can clearly detect a kind of frequency modulation with the appropriate experience. If you compare the RTTY-Signals in the figure below with the goose signals shown in the same figure, you will find out that the RTTY-signal is extended over a long time. In addition, the figure below only represents a short cut of a much more longer continuous RTTY-signal. The next figure shows the analysis of a recording made at Mariadorf. Besides the known goose signal (1 and 2), recorded synchroeously at Hürtgenwald (30 km away), you can see a kind of RTTY-signal with lower intensity (3). The signal is characterized by a permanent repeating of the following time symmetric pattern: Sinewave signal at lower frequency, sinewave signal at higher frequency, moulated signal, sinewave of higher frequency, sinewave at lower frequency. Frame number four marks an also rather blurred section where frequency shiftings in positive and negative directions are happening around a center frequency of 12.5 Hz. The following figure represents a recording made in september 2008 at the periphery of a small village (Biesingen), located 20 kilometers east from Saarbrücken, Germany at the countryside. The coil antenna was installed on a parking lot of a small solitary country hotel. The signal was registrated during the whole (holiday-) weekend. It also could be received in the hotel room (20 meters away from the parking area), but it had its maximum intensity at the parking lot. The signal has a more simple structure than the ones shown at the previous figures as it only shifts between two or sometimes three frequencies. In addition, the signal is relatively high in its intensity and can be recognized clearly. The shifting between two frequencies close to each other is clearly to see. Besides the two relatively strong main frequencies there seems to be a number of additional frequencies belonging to the signal. Due to the beackground noise its hard to give a precise judgement in this case. The following figure shows a comparison between a day recording (left) and a night recording of the signal in question. In the night, the lower frequency seems having become higher. Commercial and military data transfer following this pattern is called FSK (Frequency Key Shifting) an still used for worldwide radio communication. If you play back the signal shown above (in acceleration mode), it sounds similar to the old morse code on shortwave. The following signal was recorded in October 2008 at the Lake Bigge (Biggesee) 60 kilometers east of Cologne. 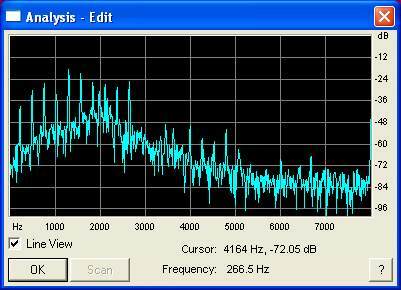 In the figure you can see a number of parallel lines from nearly zero up to 25 Hz changing in their intensity. When playing back acceleratedly, the signal sounds exactly like a certain kind of multichannel FKS-Data transfer used on shortwave radio and reminds of the sound of a permanent chinese gong. Figure: A complex multichannel data transfer? The voice signal is one of the strangest signals ever recorded and sounds like an artificial, electronic robot voice known from science fiction movies. It can only be received at my home at Mariadorf and was discovered for the first time after I moved there. It often appears only once or twice a day for a short time in the evening between 9 and 11 PM. Because of its limited length, it is hardly to recognize at the spectrum versus time diagram if you look at the complete recording time scale. The signal consists of multiple parallel spectral lines with distances of 1.6 Hz which cover the main wave (1.6 Hz) up to the tenth harmonic of 16 Hz. The characteristic voice sound is given by the fact that all spectral lines are changing randomly in their intensity over time. This results in sequences of sound reminding at spoken vocals or even short words. Psychologists say that hearing familiar sounds or even seeing known shapes when listening to random sounds or when looking at random patterns is a typical human behaviour, but a look at the spectral lines soon convinces that they absolutely match to those created by real human voices. In most of the recorded samples, the voice signals consist of sequences of vocals that make no sense, but sometimes the vocals are connected by consonants. Some recorded examples contain words which sound like substantives of the German or Englisch language and sometimes like words with no sense at all. Here some examples frequently repeated from day to day (pronounced in German language): Toooat, pieee, iglu, panic, sieben . Ju pi name ieee tieee (pronounced in German language). In English it would sound like: UP name ET. The figure below shows the spectrum of the UP name ET sequence. The following figure shows a collection of cuts recorded at different days and glued together. When playing back, you hear words of vocals and consonants making no sense. The FFT-spectrum (at a fixed time) shows in the lower frequency range (left) the regular distances of the voice signal spectrum lines. As the signal is multiplied in its frequency by 160, the frequency values shown in the diagram have to be divided by 160. The figure below shows the possible positions of the spectral lines (marked black) in a spectrum versus time diagram. That the voice signal really consists of any kind of language may be excluded, but the fluctuations in the different frequency bands between 1.6 and 16 Hz are typical for data transfer. But why are these signals so short and why do they appear only once or twice a day at evening time? If its no data transfer: Which machine or device in my neighbourghood creates such a frequency pattern that is not created by any other machine at all the places we examined before? 1) registrated only rarely inspite of longtime measurements at the corresponding places. The signals of type 2 therefore could also be signals which appear frequently at a certain place and which are typical fort this special location. The fact, that at each new measurement location we found signals never detected before at different places, is of special interest. Some of these signals are similar to each other and therefore can be grouped together to one family . The multitude of all the signals one more time puts the question of their origin: Are there really so many technical devices which create such a number of different signals? Why does each location has its own typical signals? Are they perhaps created by geological processes? This would not explain those obviously artificial structures found in the whistler-, the goose- or the RTTY-signals. The optical quality of some the following screenshots is not so perfect because of the low intensity of the corresponding signals. Even in these cases you would get a good impression when hearing the sound of the recordings, played back acceleratedly. This is no wonder because the human ear inspite of all powerful software is still the best analyzer: Not before hearing the signal, we could identify the signal shown at the following screenshot as a typical needle-printer-signal, recorded at Allershausen, Germany. The spectrum of the beep sound (it really sounds a little like an alarm-beep signal of an electronic device) is comparable to the heartbeat signal, with the difference, that the spectral lines of the beep are much more expanded. It appears very rarely and could be registrated at different locations within Germany. The line at the upper margin of the picture was created by the 16 2/3 Hz supply current of the railway system. The short signal at the right margin is a little different in its frequency but sounds similar to the other ones. Many years, we only received one single goose signal: the one that we described in detail in our last article and which seems to have its origine at Hürtgenwald. Accidently, during a holiday trip to the Biggesse (Lake Bigge, 60 kilometers north-east of Cologne), Franz Peter received a signal nearly idetical to the known one, with one difference: The groups of signals contain up to nine instead of eight elements. This signal is not identical to the signal of Hürtgenwald, because at the time it was recorded, the known goose signal from Hürtgenwald was no more to receive since many months. The signal was not strong enough to be identified by the appropriate time signal. So we were not able to see if the coding respectively the amplitude modulation of the signal had the same structure then the old one. This does not implicate that the signal itself must have a lower intensity: The source could have also been in a much more bigger distance from the receiver than it was the case of the known goose signal. Figure:Goose signal at the Biggesee (Lake Bigge) 60 km north-east of Cologne. Also, the little town Gerlingen near Stuttgart, Germany, seems to be an interesting place for ELF-signals: Most of the signals shown below have their own, typical character and differ a lot from all signals presented until now. The signals represented by the bright stains on the left of the screenshotbelow (and at the middle of the zoom at the next screenshot) are reminding of exotic animals at night in the jungle. A look at the time signal shows that the signals in question are made of bursts, that means of identical groups of waves of the same frequency repeating itselves and interrupted by pauses of constant length. By the way the sounds of crickets and even frogs are based upon the same priciple. Spectral lines of one constant frequency with regulare interruptions in time (intermitting lines) also belong to the signals that can be received very often. Figure: Intermitting line at Hürtgenwald. At Hürtgenwald for example, an intermitting line of 25 Hz could be received nearly constantly for many years (picture above). As the 50 Hz Lowpass filter is already active in this frequency range, the intensity of the signal may even have been bigger than shown in the spectrum analysis. In addition, 25 km away from this location, at the small village St. Jöris near Aachen, a similar signal (at 10 Hz) could be received. In spite of the big distance, the goose signal coming from Hürtgenwald can also clearly be seen. Besides the strange animal-like sounds, the recordings from Gerlingen also contained a kind of howling which sounds very spooky. The picture belows shows the falling and curve shaped lines in the deep frequency range which are responsible for that sound. A permanently repeated signal which reminds at the sound of the night-bird fogey, was recorded at Dudweiler near Saarbrücken in the year 2005 during a nighttime recording in a private house in a calm housing area. Similar signals have also been found at different regions. The fogey signals are charaterized by the fact that they consist of only one spectral line without any harmonics and that the frequency is sinking during progress of time. The picture below shows three fogey signals from the recording mentioned above. To have a better overview, the long time distances between the three single fogey signals have been cut from the recording. Sometimes, we found similar signals which differ from the fogey signals by a missing frequency shift (picture below). Zierenberg not far from Kassel in Germany: The signal shown in the figure below was recorded in a hotel room. As it is only a little stronger than the background noise, the thin spectral lines of a melody like signal are hardly to see. But if you would be able to listen to it (accelerated playback), you could get the impression of listening to a kind of classical symphony due to the fact, that even the length of the different tones are not equal but correspond to the typical structure of musical notes with their individual character. Since may 2006, when I moved to my new home at Mariadorf, I receive the foghorn signal, which repeats itself more or less regular in distances of hours. At the first look, its spectrum is similar to the cow signal spectrum. When listening to the accelerated playback, you'll find a significant difference. Instead of sounding like cow, you have the impression of listening to a foghorn of a big ship. The picture below shows the differences between the spectrum of the foghorn (left) and the spectrum of the cow signal: The spectral lines of the foghorn are much more close to each other (in the frequency range). In addition, the mounting in the frequency range of the spectral lines at the beginning of the cow signal can not be found at the foghorn signal. Figure: Comparison foghorn- and cow-signals. Everyone may know the typical sound of a pan flute, when the player is shifting the instrument from right to left in front of his mouth: The listener hears a quick sequence of continuously mounting tones with sine character. At Bübigen near Saarbrücken in Germany, we recorded a sound similar to this in a house in the middle of a quiet housing area at the border of a forest. During the recording, the pan flute cycles repeated over the whole measurement period of four hours. The figure below shows two of those cycles which seem to be completely identical. Besides the typical pan flute sound with its arrow like spectrum, you can still recognize a sequence of bigger and longer frequency steps. As the signal was not very strong, we highlighted the spectral lines in questions at the first cycle in the next figure. Not all signals are characterized by regular patterns. Sometimes it sounds as if someone would randomly change the frequency settings of an LF-sinewave generator and send its output signals via an amplifier to the ground. The irregular signal in the figure below was recorded on a summer-sunday afternoon in 2004, lasted in real time a few minutes and was very strong. As a reference, you can find the 16 2/3 Hz railway supply and the cow signal (right margin). In comparison to the cow signal, which already had a high intensity, you may have an impression of the high level of the squeal signal. In combination with RTTY-signals, frequencies changing relatively fast between two values have already been presented. These changes may also happen much more slowly, like many recorded examples prove. The frame at the picture bellows marks a signal where these frequency changes last up to ten minutes or longer in real time. Finally: The authors are looking forward for any comment or important hint to this article.